THE annual 2017 Uckers championships went down a storm. 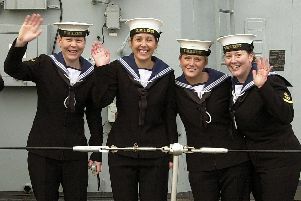 The event took place in the Royal Naval Submarine Museum, in Gosport, on Saturday. The traditional navy board game, which is similar to Ludo, has been played on ship and shore establishments around the world for the past 100 years and Prince Harry was photographed playing it during his tour of Afghanistan. There were an array of prizes on offer and the final was played on a large board donated by HMS Daedalus. The final lasted 35 minutes and the prize went to pair Frank Fowler and Harry Stannard, known as the One Nine Niners.Apart, who won a trophy two bottles of rum, an Uckers board and a certificate from the museum.